Length 120 cm, Width 2.5 cm, Size Large; The lead does not stretch itself. 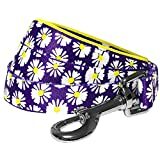 This entry was posted in Dogs and tagged 2.5cm, Available, Blueberry, Collar, Comfortable, Daisy, Dogs, Handle, Harness, Large, Lead, Leads, Loving, Matching, Prints, Separately, Soft, Summer, Valentine by One Boutique. Bookmark the permalink.